Discussion in 'Masonic Blogs' started by My Freemasonry, Aug 8, 2012. A brother sent me this photo. Can anyone identify it, the country and obedience? Click it to enlarge. It is Masonic, it may be European, not Cubian. 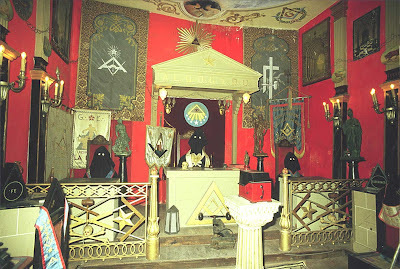 I have seen Lodge pics from European countries that look like this. They are usually small, have three steps that lead into an area where the Master sits in the East. Walls and ceilings are usually covered with Masonic items and paintings and drawings. After looking at this pic, it could also be South American, some Brazilian Lodges look similar to this. 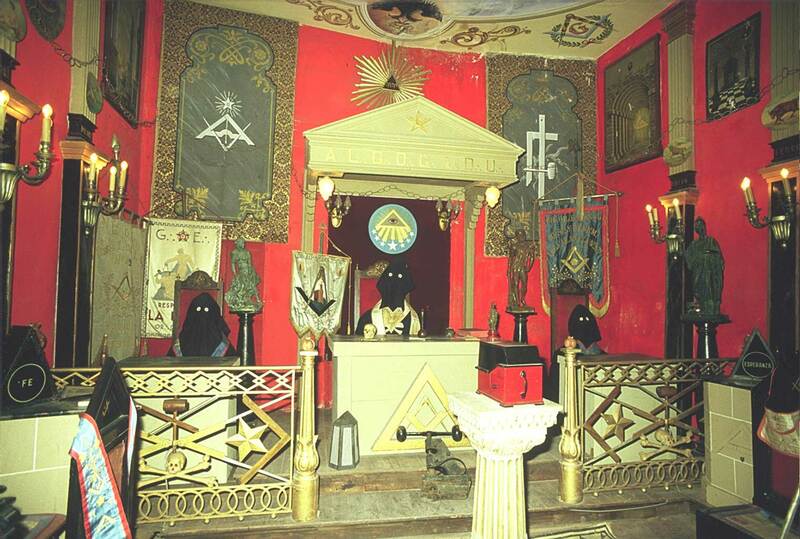 It is in Spain, and is an exhibit by anti-Freemasons about Freemasonry and it's "evil" ways. Why hoods? Why are the s&q sideways? I like the Spain answer, but cannot verify it. I have sat in lodge in Europe and south America and have never seen anything like this. Because it was a display to show how evil Freemasons are, hoods and sideways symbols helps in that effort. The covering over what looks to be the "master" has the abreviation A.L.G.D.G.A.D.U., which according to Mackey's Encylcopedia of Freemasonry is A la Glore du Grand Architecte del' Univers... Translated to English is "To the Glory of the Grand Achitect of the Universe". Mackey said it was the usual caption of French Masonic documents. Also, the banner behind the hooded person on the left has the abbreviation G.E., which Mackey alo says to be either Grand Encampment or Grand East. In the center of the picture, up at the ceiling is a doubleheaded eagle. Scottish Rite has a lot of history coming from France. Though, I see other things that could link to other SR stuff, and also YR stuff. Whether regular or irregular, Masonic or anti-masonic, possibly the source of this potentially be French or some place that has strong French roots?? ?